Trees to 21m; trunk to 1.5m diam., straight to twisted and contorted; crown conic, becoming rounded to irregularly spreading. Bark pale gray, from distance appearing whitish to light gray and smooth, in age separating into thin plates. Branches spreading to ascending, often persistent to trunk base; twigs stout, pale red-brown, with light brown, often glandular puberulence, somewhat roughened by elevated scars, aging gray to pale gray-brown. Buds ovoid, light red-brown, 0.8--1cm; scale margins entire. Leaves 5 per fascicle, mostly ascending and upcurved, persisting 5--8 years, 3--7cm ´ 1--1.5(--2)mm, mostly connivent, deep yellow-green, abaxial surface less so, adaxial surface conspicuously whitened by stomates, margins rounded, minutely serrulate distally, apex conic-acute; sheath 0.8--1.2cm, shed early. Pollen cones cylindro-ovoid, ca. 10--15mm, scarlet. Seed cones remaining on tree (unless dislodged by animals), not opening naturally but through animal agency, spreading, symmetric, broadly ovoid to depressed-ovoid or nearly globose, 4--8cm, dull gray- to black-purple, sessile to short-stalked; scales thin-based and easily broken off; apophyses much thickened, strongly cross-keeled, tip upcurved, brown; umbo terminal, short, incurved, broadly triangular, tip acute. Seeds obovoid; body 7--11mm, chestnut brown, wingless. 2 n =24. Thin, rocky, cold soils at or near timberline, montane forests; 1300--3700m; Alta., B.C. ; Calif., Idaho, Mont., Nev., Oreg., Wash., Wyo. 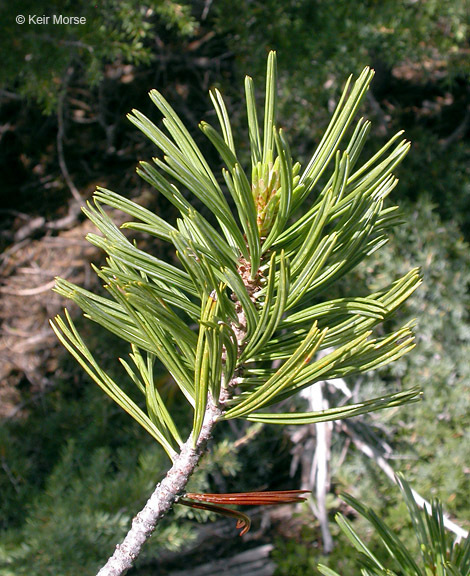 Although two reliable dendrologists, G. B. Sudworth (1917) and N. T. Mirov (1967), include Utah in the distribution of Pinus albicaulis , more recent workers have not found it to occur there. The fresh-cut wood of Pinus albicaulis is sweet-scented. Seeds are dispersed mainly by Clark's nutcracker [ Nucifraga columbiana (Wilson), family Corvidae].